For the related instrument, see Glass harp. Not to be confused with Jal tarang. 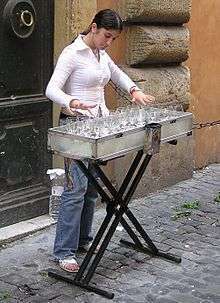 A glass harp, an ancestor of the glass armonica, being played in Rome. The rims of wine glasses filled with water are rubbed by the player's fingers to create the notes. The name "glass harmonica" (also "glass armonica", "glassharmonica"; harmonica de verre, harmonica de Franklin, armonica de verre, or just harmonica in French; Glasharmonika in German; harmonica in Dutch) refers today to any instrument played by rubbing glass or crystal goblets or bowls. The alternate instrument consisting of a set of wine glasses (usually tuned with water) is generally known in English as "musical glasses" or the "glass harp". When Benjamin Franklin invented his mechanical version of the instrument in 1761, he called it the armonica, based on the Italian word armonia, which means "harmony". The unrelated free-reed wind instrument aeolina, today called the "harmonica", was not invented until 1821, sixty years later. The word "hydrodaktulopsychicharmonica" is also recorded, composed of Greek roots to mean something like "harmonica to produce music for the soul by fingers dipped in water" (hydro- for "water", daktul- for "finger", psych- for "soul"). The Oxford Companion to Music mentions that this word is "the longest section of the Greek language ever attached to any musical instrument, for a reader of The Times wrote to that paper in 1932 to say that in his youth he heard a performance of the instrument where it was called a hydrodaktulopsychicharmonica." The Museum of Music in Paris displays a hydrodaktulopsychicharmonica. Because its sounding portion is made of glass, the glass harmonica is a type of crystallophone. The phenomenon of rubbing a wet finger around the rim of a wine goblet to produce tones is documented back to Renaissance times; Galileo considered the phenomenon (in his Two New Sciences), as did Athanasius Kircher. The Irish musician Richard Pockrich is typically credited as the first to play an instrument composed of glass vessels by rubbing his fingers around the rims. Beginning in the 1740s, he performed in London on a set of upright goblets filled with varying amounts of water. His career was cut short by a fire in his room, which killed him and destroyed his apparatus. Edward Delaval, a friend of Benjamin Franklin and a fellow of the Royal Society, extended the experiments of Pockrich, contriving a set of glasses better tuned and easier to play. During the same decade, Christoph Willibald Gluck also attracted attention playing a similar instrument in England. Benjamin Franklin invented a radically new arrangement of the glasses in 1761 after seeing water-filled wine glasses played by Edmund Delaval at Cambridge in England in May 1761. Franklin worked with London glassblower Charles James to build one, and it had its world premiere in early 1762, played by Marianne Davies. Some attempted improvements on the armonica included adding keyboards, placing pads between the bowls to reduce sympathetic vibrations, and using violin bows. Another supposed improvement claimed in ill-informed post-period observations of non-playing instruments was to have the glasses rotate into a trough of water. However, William Zeitler put this idea to the test by rotating an armonica cup into a basin of water; the water has the same effect as putting water in a wine glass – it changes the pitch. With several dozen glasses, each a different diameter and thus rotating with a different depth, the result would be musical cacophony. This modification also made it much harder to make the glass "speak", and muffled the sound. In 1975, an original armonica was acquired by the Bakken Museum in Minneapolis and put on display, albeit without its original glass bowls (they were destroyed during shipment). It was purchased through a musical instrument dealer in France, from the descendants of Mme. Brillon de Jouy, a neighbor of Benjamin Franklin's from 1777 to 1785, when he lived in the Paris suburb of Passy. Some 18th- and 19th-century specimens of the armonica have survived into the 21st century. 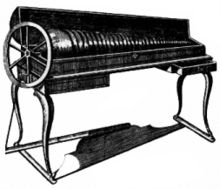 Franz Mesmer also played the armonica and used it as an integral part of his Mesmerism. An original Franklin armonica is in the archives at the Franklin Institute in Philadelphia, having been donated in 1956 by Franklin's descendants after "the children took great delight in breaking the bowls with spoons" during family gatherings. It is only placed on display for special occasions, such as Franklin's birthday. The Franklin Institute is also the home of the Benjamin Franklin National Memorial. A website has attempted to catalog publicly known Franklin-era glass armonicas. The Museum of Fine Arts, Boston has an early 19th century instrument on display, which is occasionally used for public performances and recordings. Part of the original manuscript score of "Aquarium" from The Carnival of the Animals by Camille Saint-Saëns. The top staff was written for the (glass) "Harmonica". Wolfgang Amadeus Mozart, Ludwig van Beethoven, Richard Strauss, and more than 100 other composers composed works for the glass harmonica; some pieces survive in the repertoire through transcriptions for more conventional instruments. European monarchs indulged in playing it, and even Marie Antoinette took lessons as a child from Franz Anton Mesmer. Camille Saint-Saëns used this instrument in his The Carnival of the Animals (in movements 7 and 14). Gaetano Donizetti originally specified the instrument in Lucia di Lammermoor as a haunting accompaniment to the heroine's "mad scenes", though before the premiere he was required by the producers to rewrite the part for two flutes. 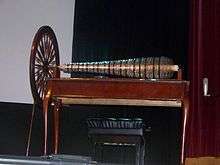 Since the armonica's performance revival during the 1980s, composers have again written for it (solo, chamber music, opera, electronic music, popular music) including Jan Erik Mikalsen, Regis Campo, Etienne Rolin, Philippe Sarde, Damon Albarn, Tom Waits, Michel Redolfi, Cyril Morin, Stefano Giannotti, Thomas Bloch, Jörg Widmann, and Guillaume Connesson. The music for the ballet Othello by American composer Elliot Goldenthal opens and closes with the glass harmonica. The ballet was performed at San Francisco Ballet, the American Ballet Theater, the Joffrey Ballet, and on tour in Europe including at the Opera Garnier with Dennis James performing with his historical replica instrument. George Benjamin's opera Written on Skin, which premiered at the 2012 Aix-en-Provence Festival, includes a prominent part for written for "armonica". This was originally intended for the mechanized Franklin glass armonica, but the composer now accepts the performance use of a verrophone and other rubbed glass sound producing devices. Marianne Davies, who played flute and harpsichord – and was a young woman said to be related to Franklin – became proficient enough at playing the armonica to offer public performances. After touring for many years in duo performances with her celebrated vocalist sister, she was also said to have been afflicted with a melancholia attributed to the plaintive tones of the instrument. Marianne Kirchgessner was an armonica player; she died at the age of 39 of pneumonia or an illness much like it. However many others, including Franklin, lived long lives. A modern version of the "purported dangers" claims that players suffered lead poisoning because armonicas were made of lead glass. However, there is no known scientific basis for the theory that merely touching lead glass can cause lead poisoning. Lead poisoning was common in the 18th and early 19th centuries for both armonica players and non-players alike; doctors prescribed lead compounds for a long list of ailments, and lead or lead oxide was used as a food preservative and in cookware and eating utensils. Trace amounts of lead that armonica players in Franklin's day received from their instruments would likely have been dwarfed by lead from other sources, such as the lead-content paint used to mark visual identification of the bowls to the players. The somewhat disorienting quality of the ethereal sound is due in part to the way that humans perceive and locate ranges of sounds. Above 4 kHz people primarily use the loudness of the sound to differentiate between left and right ears and thus triangulate, or locate the source. Below 1 kHz, they use the phase differences of sound waves arriving at their left and right ears to identify location. The predominant pitch of the armonica is in the range of 1–4 kHz, which coincides with the sound range where the brain is "not quite sure", and thus listeners have difficulty locating it in space (where it comes from), and discerning the source of the sound (the materials and techniques used to produce it). Benjamin Franklin himself described the armonica's tones as "incomparably sweet". The full quotation, written in a letter to Giambattista Beccaria, an Italian priest and electrician, is: "The advantages of this instrument are that its tones are incomparably sweet beyond those of any other; that they may be swelled and softened at pleasure by stronger or weaker pressures of the finger, and continued to any length; and that the instrument, once well tuned, never again wants tuning." Dennis James plays the armonica at the Poncan Theatre in Ponca City, Oklahoma, on April 2, 2011. Music for glass harmonica was all-but-unknown from 1820 until the 1930s (although Gaetano Donizetti intended for the aria "Il dolce suono" from his 1835 opera Lucia di Lammermoor to be accompanied by a glass armonica, and Richard Strauss specified use of the instrument in his 1919 opera Die Frau ohne Schatten), when German virtuoso Bruno Hoffmann began revitalizing interest in his individual goblet instrument version that he named the glass harp for his stunning performances. Playing his "glass harp" (with Eisch manufactured custom designed glasses mounted in a case designed with underlying resonance chamber) he transcribed or rearranged much of the literature written for the mechanized instrument, and commissioned contemporary composers to write new pieces for his goblet version. Franklin's glass armonica design was reworked yet again without patent credit by master glassblower and musician, Gerhard B. Finkenbeiner (1930–1999) in 1984. After thirty years of experimentation, Finkenbeiner's imitative prototype consisted of clear glasses and glasses later equipped with gold bands mimicking late 18th-century designs. The historical instruments with gold bands indicated the equivalent of the black keys on the piano, simplifying the multi-hued painted bowl rims with white accidentals as specified by Franklin. Finkenbeiner Inc., of Waltham, Massachusetts, continues to produce versions of these instruments commercially as of 2014, featuring glass elements made of scientific formulated fused-silica quartz. French instrument makers and artists Bernard and François Baschet invented a modern variation of the Chladni Euphone in 1952, the "crystal organ" or Cristal di Baschet, which consists of up to 52 chromatically tuned resonating metal rods that are set into motion by attached glass rods that are rubbed with wet fingers. The Cristal di Baschet differs mainly from the other glass instruments in that the identical length and thickness glass rods are set horizontally, and attach to the tuned metal stems that have added metal blocks for increasing resonance. The result is a fully acoustic instrument, and impressive amplification obtained using fiberglass or metal cones fixed on wood and by a tall cut out multi-resonant metal part in the shape of a flame. Some thin added metallic wires resembling cat whiskers are placed under the instrument, supposedly to increase the sound power of high-pitched frequencies. Dennis James recorded an album of all glass music, Cristal: Glass Music Through the Ages co-produced by Linda Ronstadt and Grammy Award-winning producer John Boylan. James plays the glass harmonica, the Cristal di Baschet, and the Seraphim on the CD in original historical compositions and new arrangements for glass by Mozart, Scarlatti, Schnaubelt, and Fauré and collaborates on the recording with the Emerson String Quartet, operatic soprano Ruth Ann Swenson, and Ronstadt. James played glass instruments on Marco Beltrami's film scores for The Minus Man (1999) and The Faculty (1998). "I first became aware of glass instruments at about the age of 6 while visiting the Franklin Institute in Philadelphia. I can still recall being mesmerized by the appearance of the original Benjamin Franklin armonica then on display in its own showcase in the entry rotunda of the city's famed science museum." Another instrument that is also played with wet fingers is the hydraulophone. The hydraulophone sounds similar to a glass armonica but has a darker, heavier sound, that extends down into the subsonic range. The technique for playing the hydraulophone is similar to that used for playing the armonica. James Horner used a glass harmonica and pan flute for Spock's theme in the 1982 film Star Trek II: The Wrath of Khan. Mr. Holmes, a 2015 film based on A Slight Trick of the Mind, shows a glass harmonica being played and mentions a fictional case report by Dr Watson, revolving around an attempted murder where lead poisoning is attempted on the player. In Mitch Cullin’s 2005 novel, A Slight Trick of the Mind, Sherlock Holmes investigates the case of a grief-stricken woman’s fascination with the music of the glass harmonica. In the second season of Black Butler, a glass harmonica is used to put the guests of Alois Trancy's dinner party into a trance. ↑ Harper, Douglas. "harmonica". Online Etymology Dictionary. Harper, Douglas. "harmonic". Online Etymology Dictionary. ↑ ἁρμονία. Liddell, Henry George; Scott, Robert; A Greek–English Lexicon at the Perseus Project. ↑ Sibyl Marcuse, "Armonica", Musical Instruments: A Comprehensive Dictionary, corrected edition (New York: W. W. Norton & Company, inc., 1975). ↑ Bloch, Thomas (2009-01-30). "GFI Scientific glass blowing products and services: THE GLASSHARMONICA". Retrieved 2016-06-05. 1 2 Zeitler, William (2009). "E. Power Biggs Attempts a Keyboard Armonica". glassarmonica.com. Retrieved 2016-06-05. 1 2 The Bakken. "Glass Armonica". Archived from the original on April 5, 2007. Retrieved 2007-05-22. ↑ Zeitler, William. "Census". The Glass Armonica. William Zeitler. Retrieved 2014-07-03. ↑ "Musical glasses (armonica)". Museum of Fine Arts Boston. Museum of Fine Arts, Boston. Retrieved 2014-07-03. ↑ Goyette, Rich. "Historic Glass Armonica - MFA collection". RichGoyette.com. Retrieved 2014-07-03. ↑ Tommasini, Anthony (October 5, 2007). "Resonance Is a Glass Act for a Heroine on the Edge". The New York Times. ↑ Cope, Kevin L. (30 September 2004). 1650–1850: ideas, aesthetics, and inquiries in the early modern era. AMS Press. p. 149. ISBN 978-0-404-64410-9. Retrieved 5 April 2011. ↑ Bossler, Heinrich (1809-05-10). Marianne Kirchgessner obituary. Allgemeine Musikalische Zeitung, 10 May 1809. Obituary written by Marianne Kirchgessner's manager Heinrich Bossler. ↑ See Finger, Stanley (2006); Doctor Franklin's Medicine; U of Pennsylvania Press; Philadelphia; ISBN 0-8122-3913-X. Chapter 11, "The Perils of Lead" (p. 181–198) discusses the pervasiveness of lead poisoning in Franklin's day and Franklin's own leadership in combating it. ↑ Rothstein, Edward (January 15, 1984). "Playing on Glass". New York Times. Retrieved 2014-07-03. ↑ "Glass Harmonicas". G. Finkenbeiner Inc. G. Finkenbeiner Inc. Retrieved 2014-07-03. ↑ Wald, Elijah. "Music of the Spheres: The Glass Harmonica". Elijah Wald – Writer, Musician. Retrieved 2014-07-03. 1 2 3 Sony Classical Music. "Cristal – Glass Music Through the Ages"
↑ "History of the Armonica, Ben Franklin and Glass Armonica". Gigmasters.com. Retrieved 2013-02-21. ↑ "Bill Hayes (2) Discography at Discogs". Discogs.com. Retrieved 2014-02-12. ↑ The Glassharmonica made by Sascha Reckert. Retrieved from http://www.glasharmonika.com/index.htm. ↑ "glass harmonica". Alasdair Malloy. 2012-07-10. Retrieved 2014-03-03. ↑ "Monsters from the Id - "The Kobayashi Maru has set sail for the promised land."". Retrieved April 18, 2012. "An Extensive Bibliography". of resources about the armonica. Retrieved January 16, 2007. "Franklin, Benjamin". Franklin correspondence regarding the armonica. Archived from the original on February 10, 2007. Retrieved January 16, 2007. "Galileo, Galilei". Passage from 'Two New Sciences' by Galileo about the 'wet finger around the wine glass' phenomenon (1638). Archived from the original on February 10, 2007. Retrieved January 16, 2007. Ford, Anne (1761). Instructions for playing on the music glasses (Method). London. "A pdf copy" (PDF). Archived from the original (PDF) on February 26, 2007. Retrieved January 20, 2007. Muller, Johann Christian (aka John Christopher Moller). Anleitung zum Selbstunterricht auf der Harmonika. Wikimedia Commons has media related to Glass harmonicas. Articles (with citations) about the armonica by William Zeitler, www.glassarmonica.com, free MP3 and videos. Play the armonicaInteractive version of playing the armonica. Chisholm, Hugh, ed. (1911). "Harmonica". Encyclopædia Britannica (11th ed.). Cambridge University Press.